WOODS' Malaysia - Peppermint Cough Syrup, Cold Shield, Peppermint Lozenges - Relieves cough, sore throat, cold, stuffy nose. What is the Common Cold and Flu? The common cold and the flu are both respiratory illnesses but they are caused by different viruses. Colds are usually milder than the flu. Normal symptoms of colds is having a runny or stuffy nose while flu is worse than the common cold, and symptoms such as fever, body aches, extreme tiredness, and dry cough are more common and intense. Both are easily spread through germs that an already infected person has breathed into the air. Every day, we are exposed to countless germs and viruses from people we interact with at home, in the office and in public places. Enclosed areas like offices, elevators, buses etc are also breeding grounds for germs. Our immune system may be further weakened due to work stress and pressures, a sedentary lifestyle, poor diet and lack of sleep. With so many strains of new viruses emerging, it makes sense to protect and strengthen our immune system. Remember, prevention is better than cure! 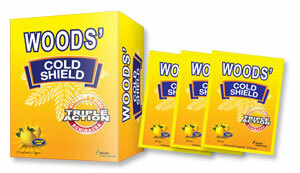 WOODS' Cold Shield is a single serve supplement with Triple Action Formula that assists in strengthening the body's immune system to help prevent against colds and flu. Just tear open the pack and mix with water to enjoy a delicious and beneficial drink. Vitamin C is a very popular treatment for colds and flu because it is well known for boosting the immune system. Scientific studies have shown that vitamin C can reduce the severity of cold symptoms, often shortening the duration of the cold. It also reduces allergies/sneezing. Zinc is a mineral that is essential to good health. Adequate levels of zinc are critical for the proper functioning of the immune system. Zinc helps to inhibit the growth of many viruses, including the common cold viruses and helps in decreasing the severity and duration of colds. Echinacea is known for its immune-strengthening ability, and has been proven effective in reducing the symptoms of colds, coughs and flu and other upper respiratory conditions. 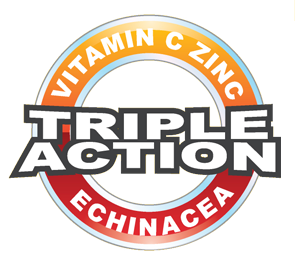 Echinacea promotes T-cell activation (a type of blood cell that protects the body from infection) and helps the good white blood cells attack invading germs. can thus be acquired from contact with these objects. • More than 200 different types of viruses are known to cause the common cold thus they are no actual vaccines for it. • Children in a school environment can have almost 12 colds a year. Find out more about causes of Cold and Flu and how to treat.